I graduated in conservation biology and recently enrolled in a PhD course at the University of Pisa. I’ve always been interested in animal behaviour and for the preparation of my MSc thesis I started to work on sea turtles, tracking the movements of loggerheads Caretta caretta in the Mediterranean Sea by satellite. The research project of my PhD is on the spatial behaviour of turtles and birds, especially in relation to environmental conditions, with the aim of understanding how the environment influences an animal’s choices. To perform preliminary investigations on the feasibility of a novel telemetry system for sea turtles by developing, testing and deploying on wild Mediterranean loggerhead turtles a low-cost GPS-GSM tag suitable for applications in the marine environment. Understanding the spatial behaviour of marine turtles is crucial to elucidate key aspects of their ecology and to define ground-based conservation measures. A fundamental prerequisite is to have a reliable system to localise turtles, possibly at contained cost. Presently, turtles are mostly tracked through the Argos satellite system, which however provides localizations at poor temporal and spatial definition and has non-negligible costs that often constrain the sample size of tracking studies, limiting their conservation value. The alternative method of acquiring GPS localizations and relaying them through mobile phone networks (see below), has never been investigated in turtles because of their tendency to mostly stay underwater, emerging only briefly to breathe. 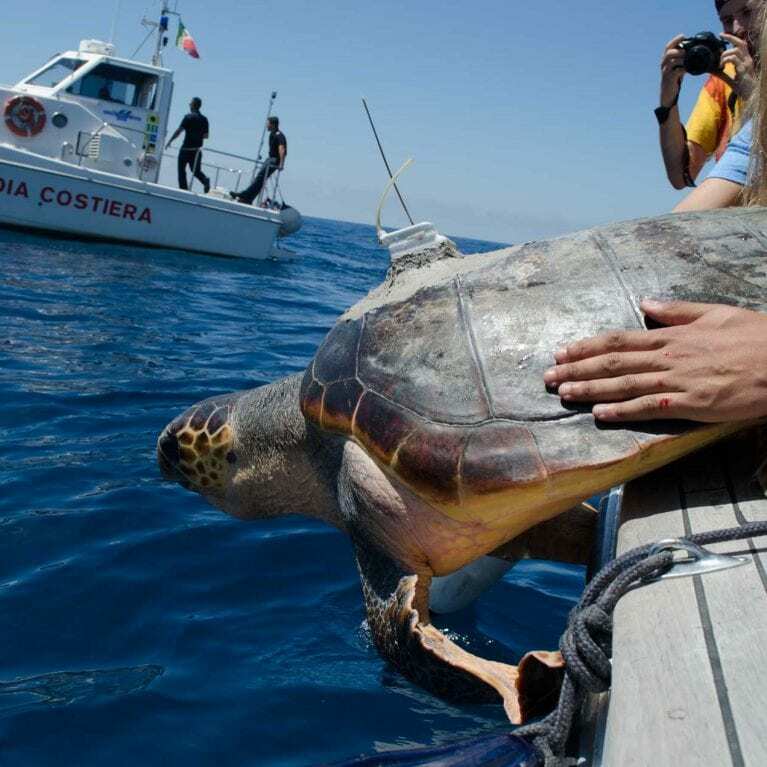 However, recent empirical findings revealed that loggerhead turtles in the central Mediterranean Sea remain at surface for non-negligible periods, making it worth to investigate the feasibility of using these low-cost GPS-GSM devices to substantially increase the number of tracked turtles. Currently, the most widespread method to track freely-moving sea turtles is the Argos system, which employs low-altitude satellites to localise turtles carrying special radio-transmitters. Still, Argos has many drawbacks, like the low temporal and spatial definition of localizations and its significant costs (transmitters: >1,000 USD each; satellite services around 100 USD per month per tag). Location quality can be improved using transmitters featuring a GPS receiver, that provides high-quality, frequent localizations, but the relay of GPS data to Argos satellites is problematic, since the narrow data bandwidth of Argos uplinks greatly restricts the amount of information obtainable. Another method is to obtain GPS locations and then relay them through the GSM international mobile phone networks. In this way, frequent and highly precise GPS localisations can be transmitted at very limited costs, thanks to the cheap mobile phone tariffs. The feasibility of such a system has never been systematically investigated in turtles, despite its widespread usage in terrestrial and flying animals. A GPS-GSM tag for Pinnipeds recently developed has been preliminarily tested on adult turtles with limited success and is still very expensive (over 6,000 USD). The main problem with turtles is their (alleged) tendency to spend most of their time submerged, which limit GPS and GSM contacts. However, recent findings obtained by our research group have shown that Mediterranean loggerheads often remain at the surface for 2-3 minutes minimum, at least once a day and often more frequently. Also, loggerheads around Italy often reside in coastal waters where they forage, thus likely under GSM coverage. Indeed, a pilot deployment of GPS-GSM tags for Pinnipeds on three loggerheads in Southern Italy has provided good indications on the possible suitability of this tracking method. To adapt commercially available GPS-GSM models suitable for wildlife tracking (small size/weight, low-cost) for deployment on marine turtles, making them to collect GPS localisations and transmit positions through GSM only when the turtle surfaces in an area covered by mobile phone networks. To make the device hydrodynamic and capable to withstand hydrostatic pressures up to 200 m, the known maximum diving depth of Mediterranean loggerhead turtles. To test the units in controlled conditions to evaluate the duration performances of different hardware/software configurations and of various batteries. Final aim is to identify the models/configurations/battery types best suited to guarantee an operative life of at least 5 weeks when deployed on wild turtles, without substantially increasing tag size. 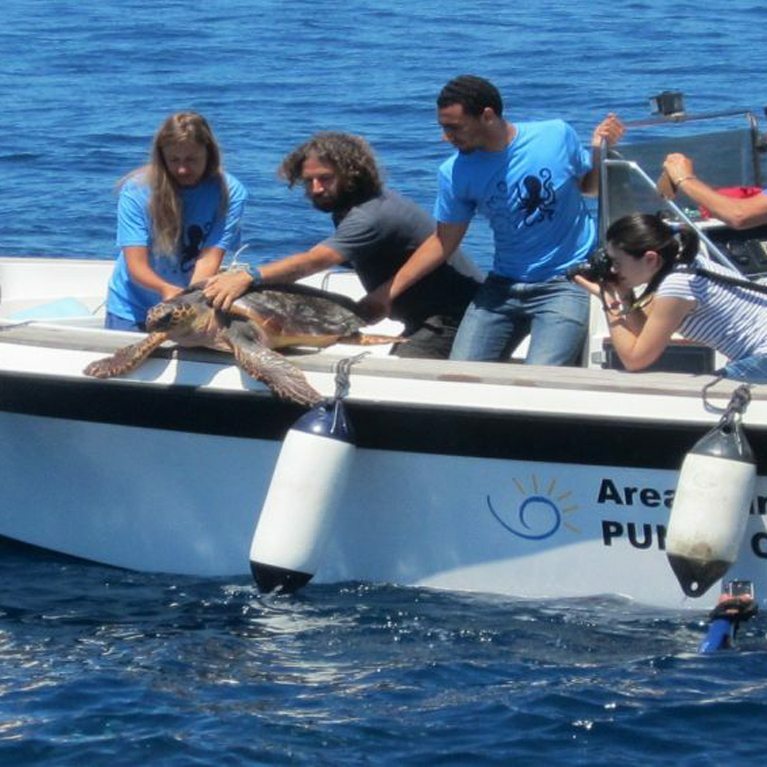 To test the prototype performances in the wild by deploying them on medium-to-large loggerheads released after rehabilitation in Italian turtle rescue centres (e.g. in Naples), taking advantage of previous, long-lasting collaborations with them. Each deployment is expected to last at least a few weeks, allowing an evaluation of tag performances. To make an overall evaluation of tested prototypes, determining the setting configuration(s) and battery types best suited to track Mediterranean loggerheads. Weak aspects to be tackled in successive stages will be identified, and possible modifications to be implemented in future developments will be considered, especially to increase tracking duration. Bimini in the Bahamas is home to large populations of sharks. 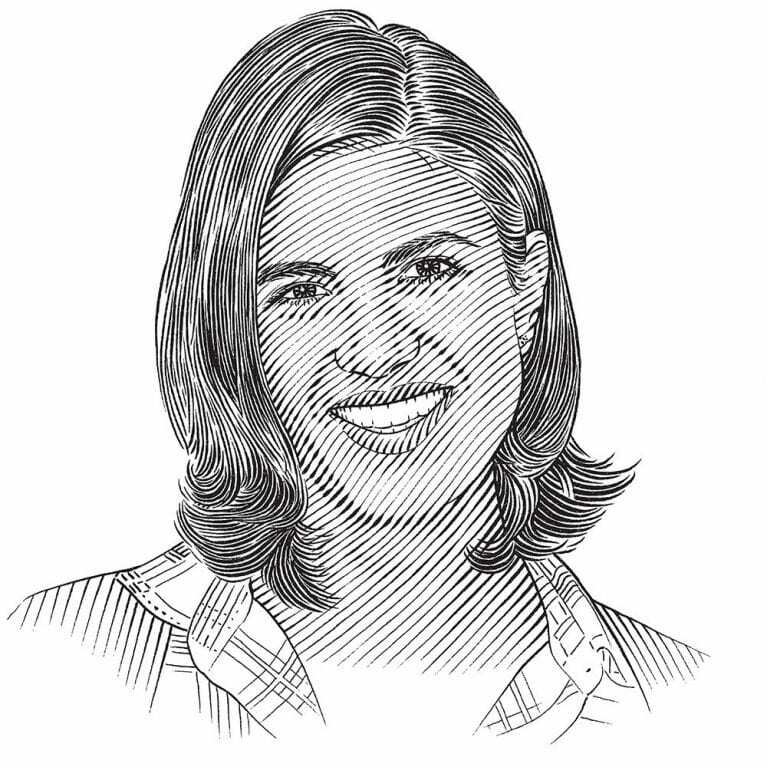 Mariana will observe whether the presence of those sharks affects how turtles use their habitat and whether more turtles means more sharks. Bimini is undergoing intensive development for tourism, so understanding how animals use their space is critical for their conservation.